This display was captured by Jan Drahokoupil in Sardinia on 6. September. 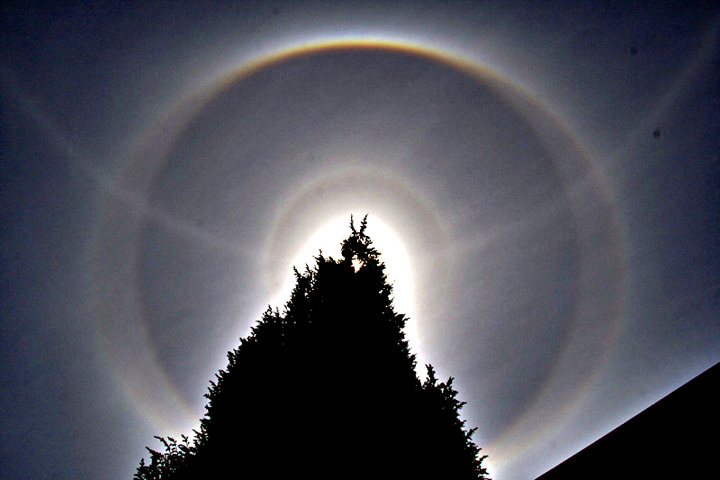 The 22° halo is surrounded by elliptical circumscribed halo. The small halo around the sun is 9° halo or 9° column arc (or both together). Simulations could give better clue. Later on the display changed and there were also 18° plate arcs. Wow now thats splendid I wonder if there were any 24 degree column arcs? That's what I've been wondering as well. Should make simulations. Wow, nice and clear display! Yep, this one's a beauty. It would be great to see photos from the anthelic region also. Jari and all, yes, I found Wegener arcs on photos, but very very very faint! I must use extreme unsharp mask. The photo besides Patrik's simulation shows also parhelia. I think sun is very close to the max sun elevation for parhelia. Would be nice to know the time and locations to count sun elevation. Patrik's simulation seems to be for lower sun elevation. Yes, my simulation is wrong for sun elevation, but for show 46halo and wegener arc is adequate.